You should call a Motorcycle Lemon Law Attorney as soon as possible if you think that your motorcycle might be a lemon. If a dealership or the manufacturer has been unable to fix a mechanical or design issue, then getting your lemon motorcycle replaced or repurchased under either the California Lemon law for motorcycles or the Federal Motorcycle lemon Law just might save your life. Our experienced lemon Law Attorneys will help get you through all the bureaucracy and get you back on the road where you belong. We offer FREE consultations, so either give us a call at 213-282-2000 or fill out our Motorcycle Lemon Law Form and let us do the rest for you. The Lemon Law Lawyers at The Law Offices of Robert Mobasseri take motorcycle lemon law claims very serious. In addition to our dedicated lawyers, we have an in-house research and development department staffed with professionals from the Auto Industry that analyze every detail of your case to make sure that nothing gets overlooked. Our two step approach separates us from other Lemon Law firms and has gained the respect of Judges, Manufacturers and Dealerships alike. Our firm has a success rate of over 99% and most of our cases are settled without ever going to trial. The California Motorcycle Lemon Law is one of the best in the country. It not only protects you from being stuck with a Lemon, but requires the manufacturer to pay for your attorney fees. Each vehicle manufacturer has a team of lawyers who specialize in fighting Lemon Law claims. By requiring the Motorcycle Manufacturer to pay for your lawyer’s fees, it gives you the opportunity to have a Lemon Law Attorney fight the “Big Guys” in getting your bike replaced or repurchased, as well as reimbursed for any other fees or damages that you might be entitled to. Motorcycle Lemon Law is a very specialized area of law that requires the experience and expertise of a motorcycle lawyer. Whether you ride your bike on the city streets to work, or roam the back-country roads of California, having your bike breakdown will leave you stranded, helpless and angry. 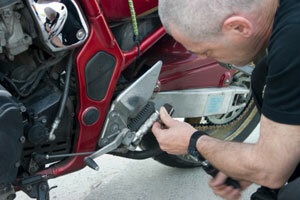 Regardless of whether your Motorcycle was purchased or leased, new or used, you may be eligible to have your bike repurchased or replaced if an authorized repair facility has not been able to repair any defect that diminishes the safety, performance, usefulness or value of your motorcycle in a “reasonable” number of attempts. If you think your Motorcycle may be a lemon, give us a call at 213-282-2000 or fill out the Motorcycle Review Form and let our experienced Lemon Law Motorcycle Attorneys fight for you.